Caleb Williams Photography Blog - Page 2 - Photography: Minneapolis style. 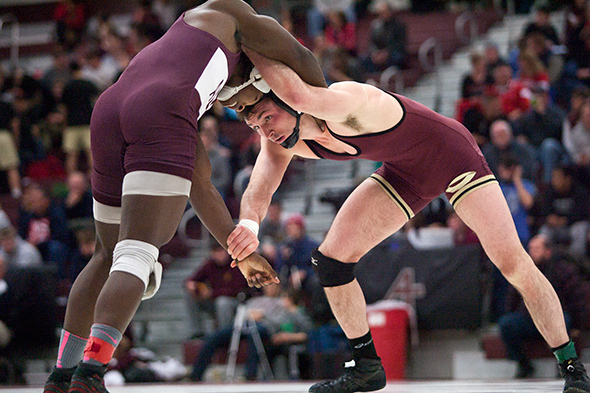 Augsburg’s Chad Bartschen­feld (left) grap­ples with St. John’s Evan Guf­fey in their 133 pound third-place match at the 2015 NCAA Div. III Wrestling West Re­gion­al at Augs­burg College’s Si Mel­by Hall on Feb. 28, 2015. Bartschen­feld won the match 6–0 to qual­i­fy for the Na­tion­al Cham­pi­onships on March 14–15. Concordia’s Ja­co­by Berg­eron (left) rolls through a scram­ble sit­u­a­tion in his 141 pound first-place match at the 2015 NCAA Div. III Wrestling West Re­gion­al with Ben Hen­le (St. John’s) on Feb. 28, 2015 at Augs­burg College’s Si Mel­by Hall. Berg­eron pre­vailed 6–5. Se­bas­t­ian Gard­ner (Con­cor­dia-Moor­head) ties up with Tyrell Mar­tin (Augs­burg) dur­ing their 174 pound first-place match at the 2015 NCAA Div. 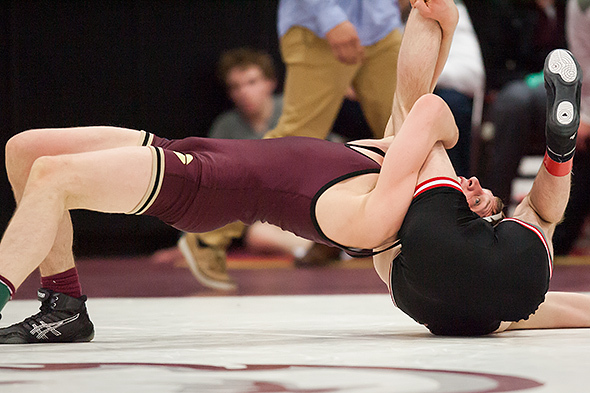 III Wrestling West Re­gion­al on Feb. 28, 2015 at Augs­burg College’s Si Mel­by Hall. Third-seed­ed Mar­tin up­set top-seed­ed Gard­ner 5–4 on a last-sec­ond take­down.